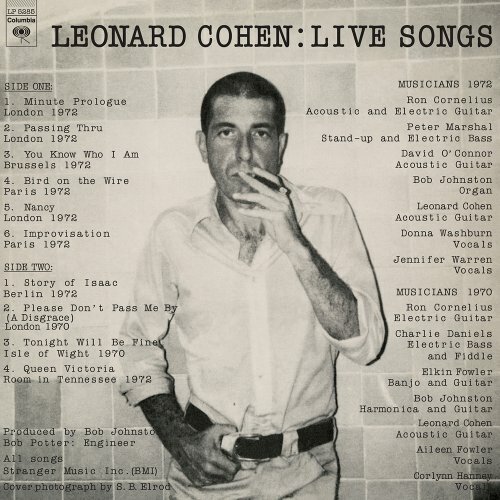 Live Songs [Vinyl] by Cohen, Leonard at Public Sounds. MPN: LP5285. Hurry! Limited time offer. Offer valid only while supplies last. By the time Leonard Cohen began his recording career in 1967, the iconoclastic Canadian troubadour was already well established as a poet and author. By the time Leonard Cohen began his recording career in 1967, the iconoclastic Canadian troubadour was already well established as a poet and author. He quickly emerged as one of the era's most original and influential singer-songwriters, building a large and legendary body of work that continues to inspire artists and listeners alike. Much of Cohen's reputation and mystique was established by his early work for Columbia Records, particularly the five albums he recorded between 1967 and 1974. Now, these five classic albums, unavailable on vinyl for two decades, have been lovingly restored to their original LP format. For their new Sundazed editions, all five albums have been meticulously remastered and have been sourced from the original Columbia Records stereo masters in order to preserve the sound of the original albums. In keeping with the exacting standards for which Sundazed has become known, each album will be pressed on high-definition vinyl, with complete original cover art. Cohen's intimate, emotion-charged live performances yielded the 1973 release Live Songs, which mixes a handful of previously recorded favorites with several new songs, including "Passing Thru," "Tonight Will Be Fine" and the harrowing, rarely-performed 13-minute epic "Please Don't Pass Me By (A Disgrace)." If you have any questions about this product by Cohen, Leonard, contact us by completing and submitting the form below. If you are looking for a specif part number, please include it with your message.